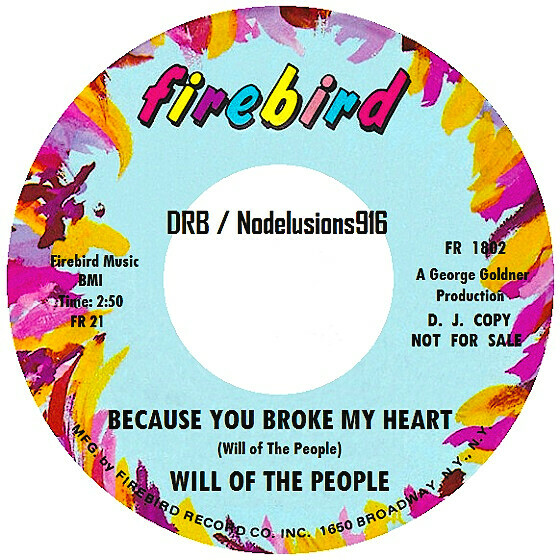 This entry was posted in drb's audio and tagged 1969, Because You Broke My Heart, Will Of The People by DRB. Bookmark the permalink. WELCOME!!!!! Most of what I list is from my library with an occasional video or photo. All that I post is strictly for educational and or entertainment purposes. Any post will be removed promptly upon request with legal cause. Much of what I post is hard to find singles, EP's, LP's & CD's with original cover art (whenever possible). I like old school r&b & soul, rola's, classic rock, jazz & a few other genre's. Feel free to ask questions, Share, Like, Heart, Tweet , Throw your hands in the air or leave any comments. These files intended for personal use only and by retrieving any music posted on this blog you are agreeing to delete any & all downloadable material after 24 hours. Lastly, the music found here is not intended for profit or to violate copyright. If you are the creator (or copyright owner) of a song, excerpt, essay, or image posted on this blog, please send me an email if you want to comment on the selection or wish to have it removed. Peace Out!!!!! Thanks for viewing & listening! OH..... I speak and read English & Spanish, any comments in any other language won't go unnoticed but will not be posted & get no response. Let's keep it simple folks. Por favor!